Accudyne Systems, Inc. has experience with a broad range of process control technologies ranging from micro Programmable Logic Controllers (PLCs) for basic machine sequencing to PC-based control systems for the coordination of thermal, pressure, and motion process conditions. We have extensive experience and software development tools for Allen Bradley, Micrologix, ControlLogix, OMRON PLCs, Modicon PLCs, and Automation Direct PLCs. Ultimately, the choice of PLC is guided by the customer’s needs. We routinely employ PLCs for machine sequencing, motion coordination, and basic process regulation. With respect to pressure control, we created a patented system for the accurate pressure control of supercritical CO2. We have also employed electro-pneumatic regulators interfaced with PLC controls for regulation of fluid pumping, force control, air motor speed control, and spray atomization and pattern control. Accudyne is a registered Wonderware systems integrator. Using the Wonderware family of applications, we have established touch-screen, man/machine interfaces; process logging; process control; and monitoring systems. 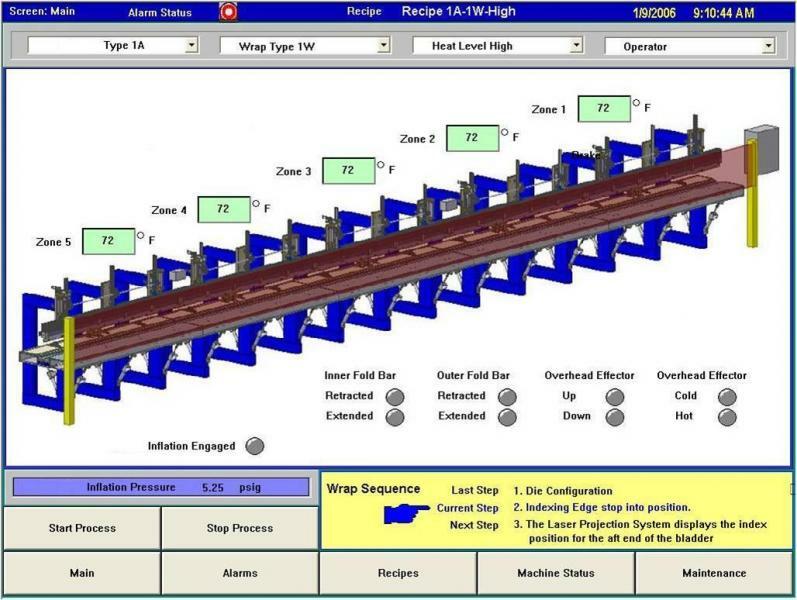 The Accudyne-implemented Wonderware interface provides operational control power and ballasting systems for the Cargolifter’s CL75 heavy-lift helium balloon. For more elaborate processes, Accudyne has combined its extensive background in PLC-control systems with extensive experience with the National Instruments LabVIEW system. This enables us to combine high speed data acquisition, process control functions, and man/machine interface activities. These LabVIEW-based systems provide great flexibility for implemented process automation with legacy sensors and instrumentation and may be deployed in an existing process.